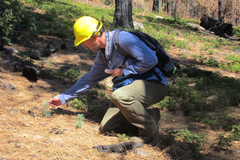 The John Muir Project engages in and supports original scientific research performed by independent scientists, including JMP’s own Chad Hanson, Ph.D., in order to find the truth which underlies the many untested assumptions that govern the management of our National Forests today. A study to learn how Pacific Fisher’s respond to mixed-intensity fire. The Pacific fisher, a rare carnivore something like a small wolverine, is strongly associated with dense, old conifer forest for its den and rest sites, so many have assumed for years that mixed-intensity fire would harm fishers. A study of Black-backed Woodpecker nest density in burned and unburned forests of the Sierra Nevada. The Black-backed Woodpecker is a very rare bird that depends heavily upon dense, mature conifer forest that has recently experienced higher-intensity fire (in large patches) and has not been subjected to post-fire logging. A study of natural post-fire conifer regeneration. A myth used by the U.S. Forest Service to justify large post-fire clearcut logging projects after wildland fires on National Forest lands is their belief that mixed-conifer and ponderosa pine forests will not naturally regenerate in large high-intensity fire patches. Appendices for Hanson C.T. and D.C. Odion 2016 (In Press). Natural Areas Journal. Appendix A (1911 forest survey excerpts) and Appendix B (1911-1916 correspondence excerpts). Hanson, C.T. 2015. Use of higher-severity fire areas by female Pacific fishers on the Kern Plateau, Sierra Nevada, California, USA. The Wildlife Society Bulletin (in press). Contact us for study. DellaSala, D.A., M.L. Bond, C.T. Hanson, R.L. Hutto, and D.C. Odion. 2014. Complex early seral forests of the Sierra Nevada: what are they and how can they be managed for ecological integrity? Natural Areas Journal 34: 310-324. Contact us for study. Hanson, C.T., and D.C. Odion. 2014. Is fire severity increasing in the Sierra Nevada mountains, California, USA? International Journal of Wildland Fire 23: 1-8. Contact us for study. DellaSala, D.A., R.G. Anthony, M.L. Bond, E.S. Fernandez, C.A. Frissell, and C.T. Hanson. 2013. Alternate views of a restoration framework for federal forests in the Pacific Northwest. Journal of Forestry 111: 420-429. Contact us for study. Hanson, C.T., D.A. DellaSala, and M.L. Bond. 2013. The overlooked benefits of wildfire. BioScience 63: 243. Contact us for study. Odion, D.C., and C.T. Hanson. 2008. Fire severity in the Sierra Nevada revisited: conclusions robust to further analysis. Ecosystems 11: 12-15. Contact us for study. Hanson, C.T., Odion, D.C. 2006. Fire Severity in mechanically thinned versus unthinned forests of the Sierra Nevada, California. In: Proceedings of the 3rd International Fire Ecology and Management Congress, November 13-17, 2006, San Diego, CA. Contact us for study. Roberts L.J., A.M. Fogg, R.D. Burnett 2015. 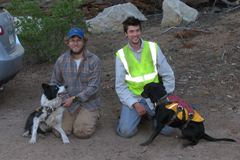 Sierra Nevada National Forests Avian Management Indicator Species. 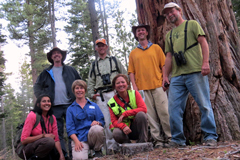 Point Blue Conservation Science 2014 Annual Report. Contact us for Report. Rota C.T. 2013. Not all Forests are disturbed equally: population dynamics and resource selection of Black-backed Woodpeckers in the Black Hills, South Dakota. Ph.D. dissertation, University of Missouri-Columbia. Download PDF. Rota C.T., J.J. Millspaugh, M.A. Rumble, C.P. Lehman, D.C. Kesler 2014. The role of wildfire, prescribed fire, and Mountain Pine Beetle infestations on the population dynamics of Black-backed Woodpeckers in the Black Hills, South Dakota. PLoS ONE 9: e94700. Contact us for study. Rota C.T., M.A. Rumble, J.J. Millspaugh, C.P. Lehman, D.C. Kesler 2014. Space-use and habitat associations of Black-backed Woodpeckers (Picoides articus) occupying recently disturbed forests in the Black Hills, South Dakota. Forest Ecology and Management 313: 161-168. Contact us for study. Baker, W.L. 2014. Historical forest structure and fire in Sierran mixed-conifer forests reconstructed from General Land Office survey data. Ecosphere 5: Article 79. Contact us for study. Baker, W.L. 2012. Implications of spatially extensive historical data from surveys for restoring dry forests of Oregon’s eastern Cascades. Ecosphere 3: article 23. Contact us for study. Williams, M.A., W.L. Baker. 2012a. Spatially extensive reconstructions show variable-severity fire and heterogeneous structure in historical western United States dry forests. Global Ecology and Biogeography 21: 1042-1052. Contact us for study. Williams, M.A., W.L. Baker. 2012b. Comparison of the higher-severity fire regime in historical (A.D. 1800s) and modern (A.D. 1984-2009) montane forests across 624,156 ha of the Colorado Front Range. Ecosystems 15: 832-847. Contact us for study. Lee, D.E., and M.L. Bond. 2015. Occupancy of California spotted owl sites following a large fire in the Sierra Nevada, California. The Condor 117 (in press). Contact us for study. Ganey, J.L., S.C. Kyle, T.A. Rawlinson, D.L. Apprill, and J.P. Ward, Jr. 2014. Relative abundance of small mammals in nest core areas and burned wintering areas of Mexican spotted owls in the Sacramento Mountains, New Mexico. The Wilson Journal of Ornithology 126: 47-52. Contact us for study. Stephens, S.L., S.W. Bigelow, R.D. Burnett, B.M. Collins, C.V. Gallagher, J. Keane, D.A. Kelt, M.P. North, L.J. Roberts, P.A. Stine, and D.H. Van Vuren. 2014. California Spotted Owl, songbird, and small mammal responses to landscape fuel treatments. BioScience (in press). Contact us for study. John Muir, My First Summer in the Sierra (1911) Chapter 10.